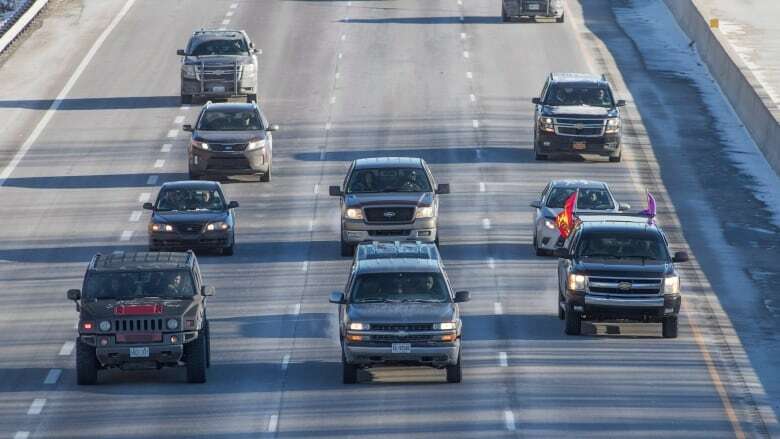 Two convoys of vehicles slowed traffic on stretches of Canada's busiest highway Friday morning in Ontario in a show of solidarity with an anti-pipeline protest in British Columbia. One rolled westbound from the eastern part of the province, while the other began in southwestern Ontario and headed east. Both left before dawn and disrupted traffic during the morning rush hour. One fleet left from the Mohawk Nation at Akwesasne, about 86 kilometres southeast of Ottawa, and travelled about 50 km/h as it moved toward Belleville, Ont. People from the Kahnawake Mohawk Territory, just south of Montreal, joined those from Akwesasne. Provincial police cruisers formed a buffer around the eight trucks and SUVs and surrounding traffic. Brandon Bigtree, who was driving one of the vehicles, said the demonstration was to show support for protesters at the Unist'ot'en camp — the site of a fortified checkpoint preventing people set to work on the Coastal GasLink pipeline project from accessing the Wet'suwet'en territory in northern B.C. Wet'suwet'en and police have agreed to allow the company access to do pre-construction work as specified in an interim injunction order for the time being, following arrests on Monday. "We're standing strong with our brothers and sisters out west. What's going on out there isn't right," Bigtree said. He said Indigenous communities across Canada feel the federal government and provinces are failing them. "We just need to let [the federal government] know that we're all united." Those in the convoy from the Mohawk Nation at Akwesasne are also trying to raise awareness about local governance issues. Some in the community are frustrated with how the elected band council has handled negotiations over a 130-year-old land grievance along the banks of the St. Lawrence River. They are advocating for the nation's hereditary leadership to play a larger role in the process. The convoy hopes to make it to ​the Tyendinaga Mohawk Territory today. Meanwhile, the second convoy left the London, Ont., area before dawn to slow Highway 401 traffic in the southwestern region of Ontario. People from the Oneida Nation of the Thames and Chippewa of the Thames First Nation were riding in the dozen vehicles that made up the motorcade. The action caused considerable slowdown for commuters. "We're doing this rolling blockade as a peaceful reminder to Canadians that First Nation people have rights to the land," said Brandon Doxtator, who was in one of the vehicles. 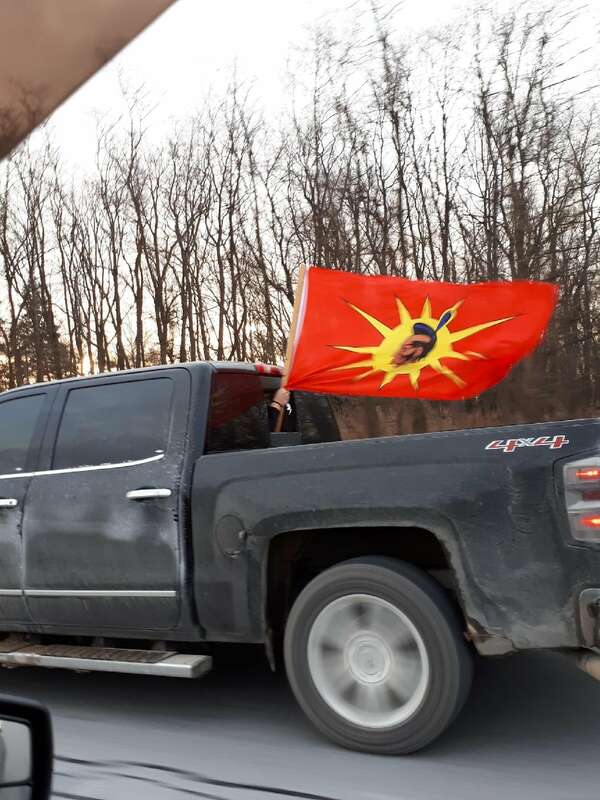 The convoy from Oneida was heading to the territory of the Six Nations of the Grand River, south of Brantford, Ont., where a rally was planned for later Friday.